Last week's Bouchercon in Toronto was terrific and memorable in so many ways, with one of the great highpoints coming on the final day, when our fellow SleuthSayers B.K. 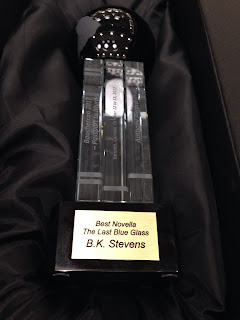 Stevens won the Anthony Award for Best Novella for her outstanding story "The Last Blue Glass." As most folks in our community know, Bonnie passed away suddenly back in August, but her husband Dennis and their daughter Rachel were in Toronto for much of Bouchercon to represent her as an Anthony finalist—attending several short story panels and being part of the weekend generally. In addition to sitting near them at the panel for Anthony Award finalists in the novella category, I was fortunate to join Dennis and Rachel along with author Debra Goldstein, Linda Landrigan of Alfred Hitchcock's Mystery Magazine (Bonnie's longtime publisher), and Linda's husband John for dinner on Saturday night—a chance to get together with friends (part of a group that had gathered at several other conferences in recent years) but also, of course, an opportunity to remember Bonnie and her work. Dennis and Rachel shared some stories from years past, the early years of Dennis' and Bonnie's marriage, theirs moves from school to school and state to state, the years of raising kids—those stories from two perspectives, of course, with Rachel looking back on her own childhood. Many stories, of course, but one image that stood out related to Bonnie's commitment to her craft: her writing days when husband and kids were elsewhere so as to give her time and space, her family committing themselves in support of her work. On Sunday, we gathered together again at the awards brunch, sat together along with Roberta Rogow, Deborah Buchanan, Michael Bracken and his wife Temple, and then Alan Orloff who arrived in time for the official presentation. Before the awards were presented, Roberta told us that she had always been good luck at awards ceremonies—that people at her table always won. Whatever role Roberta's luck played, we all erupted in cheers when Bonnie's name was called—and fought tears too when Dennis stepped up to the podium to explain what had happened to Bonnie, to talk about her long hopes of winning such an award, and to thank people in the mystery community for their support—those connections that he said meant so much to her, those friendships with her that meant so much to us. I say "fought tears" but that fight wasn't entirely won, as you might imagine. Bittersweet is the word that kept coming up time and again at the brunch and again in the days since then. Poignant is the word that Dennis himself used, and it's difficult not to feel great sadness that Bonnie wasn't there to accept the honor herself, to enjoy the moment. The Anthony Award is surely a fine capstone to Bonnie's terrific career as a short story writer, novelist, essayist, and more—but here's wishing again that it had simply been the next step in a career still being built, with more of her writings still ahead. 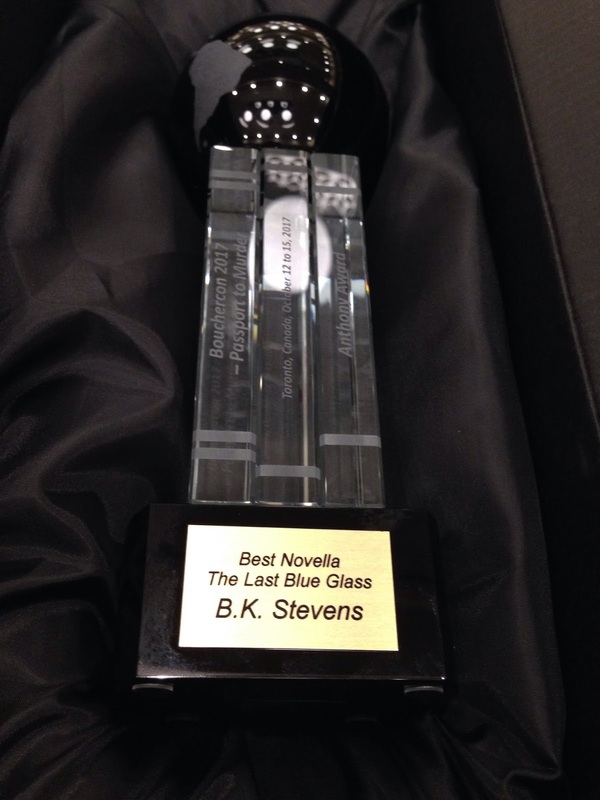 Congratulations to our fellow SleuthSayer and our too-soon-departed friend, B.K. Stevens. Thanks for commenting, David and Janice. The Anthony Award presentation was a very emotional moment, and you captured it perfectly. No dry eyes anywhere. And congratulations to you as well, for your recent win. You make us all proud. This is a wonderful tribute, and I'm tearing up again. I'm so happy you could all be together to celebrate. And, how I would love to see a photo of you and Bonnie standing side by side with your Macavity and her Anthony. I'm so very proud of you both. Thank you for sharing this experience. What a beautiful tribute, Art. So much respect and admiration in the writing community for Bonnie, and a terrible feeling of loss, even for those of us who didn't know her well. Beautiful tribute, Art. I'm happy to hear Bonnie's husband and daughter were there. If only there could be such a photo. Reading "The Last Blue Glass" inspired me the other day. Bonnie left us an incredible legacy, as writer and as friend. A lovely tribute to not only a wonderful writer, but a generous friend. The sadness and loss felt by Dennis, Rachel, and Sarah and her family (who coukdn’t attend) can’t be replaced by awards, but this one, while bittersweet, added a final moment that in the future will always bring a smile to their faces - knowing her work was respected and valued. Your words capture the other essence they will remember - that she was respected and treasured. This is a beautifully done post. I loved her story, The Last Blue Glass and nominated it for the Anthony Award. I read it when it was published in 2016 in AHMM. I didn't go to this year's Bouchercon, but I was at Bouchercon - Blood on the Bayou last year and went to a panel B.K. was on. I told her on FB that I'd nominated The Last Blue Glass and I planned to vote on it to win in the novella category, but I didn't vote because I never saw the option to do so. Maybe this is not the time to ask, but does anyone know if you need to go to the next Bouchercon in order to vote on the works you nominated from the last conference? The important thing is her story won and I'm so happy for that. She also put a great post on her own blogspot, The First Two Pages, where she gave viewers an insight into what she did in the first part of the story, why, and what it meant. I believe she posted that some time in early 2017 and I bet it's still there. Well worth reading (the story and her analysis of it on B.K. Steven's First Two Pages). Thanks Art for the information on how the Anthony Awards work. I assumed because I was able to nominate that story that I could vote for it to win too. I didn't go to Bouchercon this year, so this makes sense. I see your name all the time in AHMM, but I'm guilty of just reading stories of people I know as I'm so busy. I'll look for your stories now too. Thanks for providing the link to that great essay about The Last Blue Glass on her blogspot. I've been sharing this post to individual friends. I'm now going to share it on FB and Twitter. I read every story in her short story collection, Her Infinite Variety. Excellent.